JULIUS CAESAR, (c.47-46 B.C. 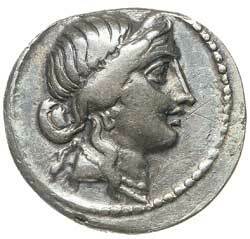 ), silver denarius, (3.51 g), Africa mint, obv. diademed head of Venus to right, dotted border, rev. 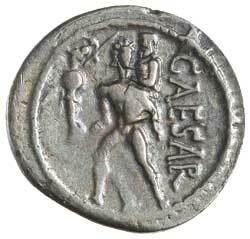 CAESAR to right, Aeneas walking left, carrying Anchises and palladium, dotted border, (S.1402, Cr.458/1, Syd.1013, RSC Julius Caesar 12). Green and blue toning, nearly very fine.